Written for Interactions magazine by Liz Sanders. Edited by Hugh Dubberly. Design research is in a state of flux. The design research landscape has been the focus of a tremendous amount of exploration and growth over the past five to 10 years. It is currently a jumble of approaches that, while competing as well as complementary, nonetheless share a common goal: to drive, inspire, and inform the design development process. Conflict and confusion within the design research space are evident in the turf battles between researchers and designers. Online communities reveal the philosophical differences between the applied psychologists and the applied anthropologists, as well as the general discontent at the borders between disciplines. At the same time, collaboration is evident in the sharing of ideas, tools, methods, and resources in online design research communities. We can also see an increase in the number and quality of global design research events and a growing emphasis on collaborative projects between industry and the universities, particularly in Europe. When asked to write a paper about the state of design research, I found that I had to make a map so that I could see what I was writing about . People who know me are aware that orienting and finding my way around physical space is not one of my strengths. Making a map is a way to hold a domain still for long enough to be able to see the relationships between the various approaches, methods, and tools. Maps are good for visualizing relationships. Maps can be useful for showing complexity and change. For example, the underlying landscape of the map may be relatively permanent, changing only as major forces affect it. But the tools and methods shift and change somewhat like trends. And the people who inhabit the landscape may come and go. As in the real world, some people like to stay put and others like to travel. So maps are good for layering complexity and for revealing change as it occurs. In making the map, I found that I needed to name the dimensions of the design research space in a way that would help bring clarity and light to the landscape. Once this happened, everything else fell quickly into place. How Is the Map Organized? 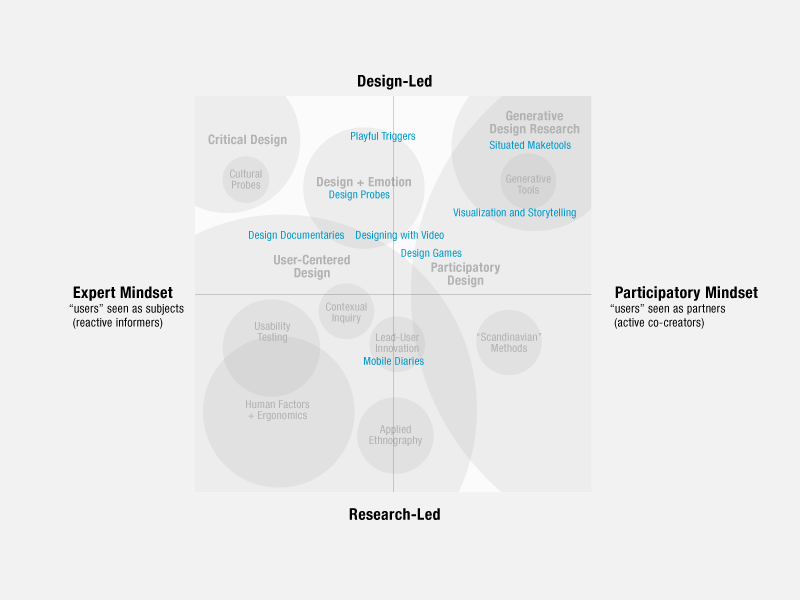 The design research map is defined and described by two intersecting dimensions: One is defined by approach and the other is defined by mind-set. 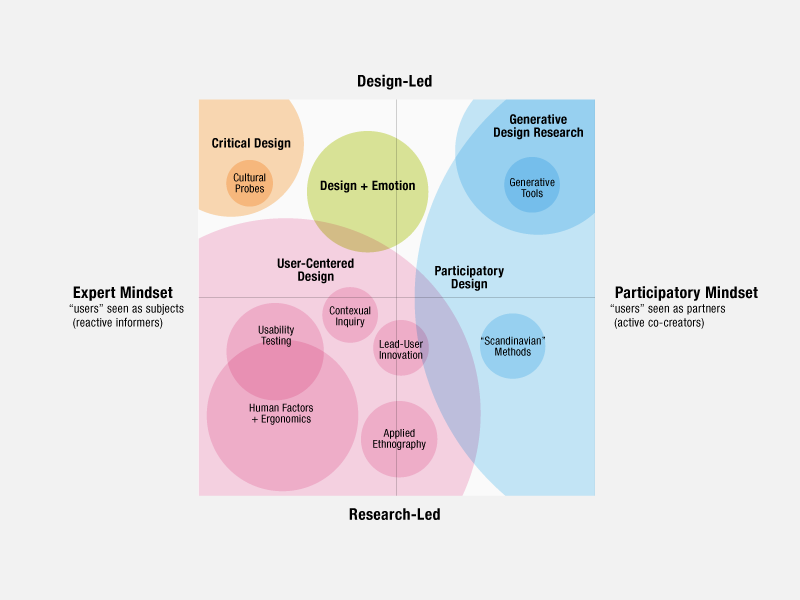 Approaches to design research have come from a research-led perspective (shown at the bottom of the map) and from a design-led perspective (shown at the top of the map). The research-led perspective has the longest history and has been driven by applied psychologists, anthropologists, sociologists, and engineers. The design-led perspective, on the other hand, has come into view more recently. 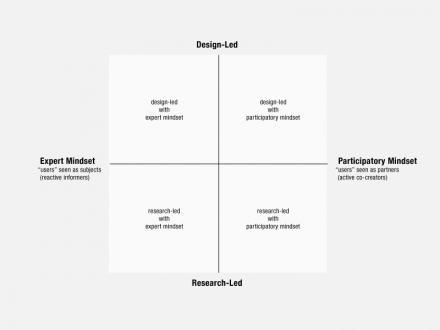 There are two opposing mind-sets evident in the practice of design research today. The left side of the map describes a culture characterized by an expert mind-set. Design researchers here are involved with designing for people. These design researchers consider themselves to be the experts, and they see and refer to people as “subjects,” “users,” “consumers,” etc. The right side of the map describes a culture characterized by a participatory mind-set. Design researchers on this side design with people. They see the people as the true experts in domains of experience such as living, learning, working, etc. 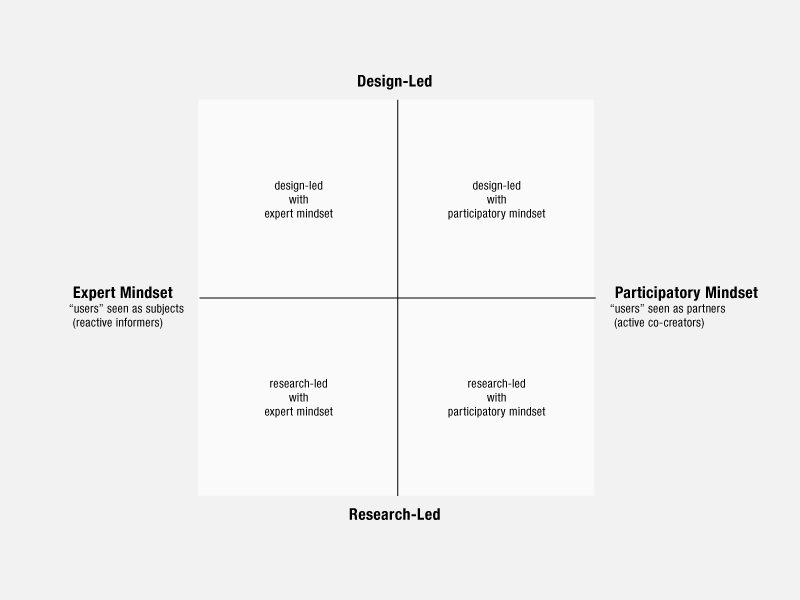 Design researchers who have a participatory mind-set value people as co-creators in the design process. It is difficult for many people to move from the left to the right side of the map (or vice versa), as this shift entails a significant cultural change. 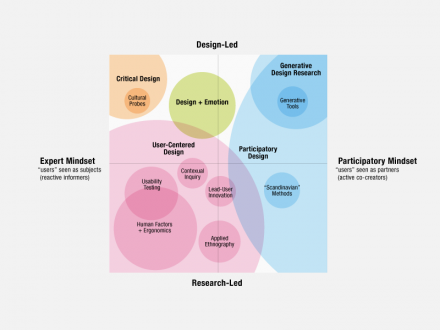 The participatory design zone spreads across both the research-led and design-led approaches on the right side of the map. Participatory design is an approach to design that attempts to actively involve the people who are being served through design in the process to help ensure that the designed product/service meets their needs. Its origins are generally traced back to work done with trade unions in several Scandinavian countries in the 1960s and 1970s . Participatory design attempts to involve those who will become the “users” throughout the design development process to the extent that this is possible. A key characteristic of the participatory design zone is the use of physical artifacts as thinking tools throughout the process, common among the methods emanating from the research-led Scandinavian tradition. The design and emotion bubble emerged in 1999 with the first Design and Emotion Conference in Delft, the Netherlands. It represents the coming together of research-led and design-led approaches to design research. Today it is a global phenomenon, with practitioners as well as academics from all over the world contributing to its development. Interested readers can learn more about it at the website of the Design and Emotion Society. 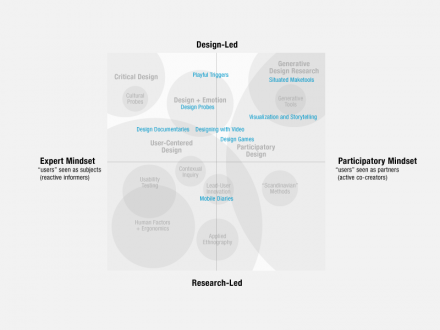 The critical design bubble (in the top left corner) is design-led, with the designer playing the role of the expert. The emergence of this bubble came about as a reaction against the large user-centered zone, with its overwhelming focus on usability and utility. Critical design evaluates the status quo and relies on design experts to make things that provoke our understanding of the current values people hold. Critical design “makes us think” . Cultural probes is a methodology in the critical design bubble . Probes are ambiguous stimuli that designers send to people who then respond to them, providing insights for the design process. Probes are intended to be a method for providing design inspiration rather than a tool to be used for understanding the experiences of others. The generative design bubble (in the top right corner) is design-led and fueled by a participatory mind-set. Generative design empowers everyday people to generate and promote alternatives to the current situation. Generative tools is a methodology in the generative design research bubble. The name “generative tools” refers to the creation of a shared design language that designers/researchers and the stakeholders use to communicate visually and directly with each other. The design language is generative in the sense that with it, people can express an infinite number of ideas through a limited set of stimulus items. Thus, the generative tools approach is a way to fill the fuzzy front end with the ideas, dreams and insights of the people who will be served through design . Both critical design and generative design aim to generate and promote alternatives to the current situation. But they operate from opposing mind-sets. Many of the new tools and methods that have emerged in the last five years are design-led and sit along the top of the map, spanning the range from the critical design bubble to the generative design research bubble. How Have I Used the Map? The map has already been useful in a number of different ways. In my academic role, the map has been very useful for teaching about the changing state of design practice and design research. At the graduate level in particular, I see a trend toward a broader mix of disciplines wanting to learn how to do design research. The map can help students from different disciplinary backgrounds to understand each others’ mind-sets, approaches, and tools for doing research. The map can help students recognize where their past training and/or experience positions them as researchers, and it can also show them new directions for exploration and learning. I have used the map to support and scaffold different modes of exploration and experimentation in the design research process. For example, graduate students (from design and engineering at the Ohio State University) who took a class in design research were asked to show where they stood on the map as a result of their previous research experiences . The students located themselves primarily on the expert-driven side of the map, spanning research-led (the engineers were here) and design-led (the designers were here) approaches. The students formed teams (made up of people from both disciplines), and each team selected a topic to explore through design research. They were then asked to decide where on the map they would like to explore. All of the teams decided to move away from the expert-driven side of the map in order to explore participatory, design-led approaches to design research. Each team made a successful learning journey on the map. The engineers were surprised to learn that research can be a creative process that can open up ideas and new opportunities. They had previously been more familiar with research for problem solving. The designers learned how to think and work with a participatory mind-set, inviting non-designers to become their partners in the creative process. On a more strategic side, I am currently using the design research map as a framework for establishing new curricula to ensure the effectiveness of learning experiences for students from diverse disciplines. One question that arises is this: Should we make separate design research maps for the different design domains such as industrial design, interior space design, interaction design, architecture, etc.? That may be useful as an interim step, particularly in academia where the design disciplines have not yet been integrated for the most part. A more useful end goal is to begin to connect the separate maps to help show the relationships between research tools and methods across all the different design domains. After all, people are people, whether they are finding their way around a building, using a product, reading a package, or using a software application. With the increased interest in and application of participatory design thinking, we will see that the professionals who understand people (whether designers or not) will be the ones to lead design in the future. In my role as a practitioner, I have used the map as a framework for writing proposals and workplans. It can also be used to explain to clients (as well as team members from other disciplines) why a variety of research approaches are needed to address different points along the design development process. On a more strategic side, I am currently using the design research map as a landscape in which to position changes taking place on the competitive front and as a framework for future scenario development. For example, by looking at changes in activity on the map over time, you can see where design research is heading and how fast it is getting there. This long view can be very useful in making strategic business decisions. How Have Others Used the Map? The map was originally offered as a scaffold to support conversation and to spark future thinking and doing. It was presented as a collage that is still taking shape. I invited readers to contribute additional dimensions, layers, zones, clusters and bubbles . A few people have taken me up on that offer. Peter Jones, managing principal at Redesign Research, Inc., used the map to position his primary area of expertise called Dialogic Design. This adds new content to the map and enriches it tremendously. Anne has changed the map by relabeling some of the areas (e.g., participatory design becomes people centered innovation) and by changing the size and manipulating the areas of overlap between some of the bubbles. She also chooses to leave certain bubbles off the map (e.g., generative design research) . How Is the Map Evolving? 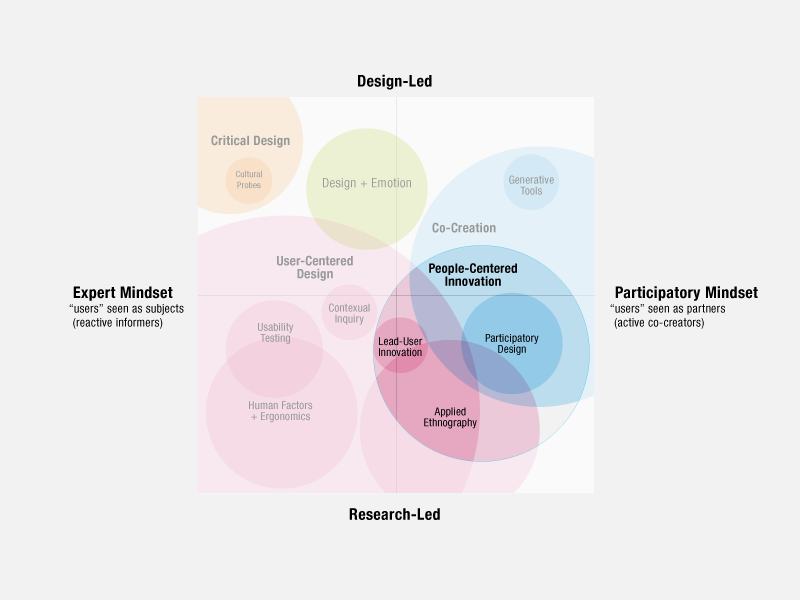 The map of design research methods can be used as a framework for organizing design research tools and methods and also as a net for capturing and revealing ideas about possible futures. It is clear that the current growth in design research is on the design-led (versus the research-led) side of things. We can expect to see more definition on this side of the map in the near future as we look to the arts and design for inspiration. Some of the new tools and methods for design research are listed below. It is interesting to note that most of them are from the European design research community. An unresolved issue is what to do with the explosion of interest in co-creation from a marketing perspective. This view appears to be focused primarily on digital forms of co-creation that takes advantage of the social networks in harnessing enormous amounts of input at a low cost. Marketing-driven approaches to co-creation are generally not being practiced from a participatory mind-set as is evidenced by their (over) use of the phrase “customer co-creation.” If people were truly valued as co-creators, they would likely be seen and referred to as “partners” or “co-creators,” not “customers.” It is as though the co-creative marketers are not on the map, but are seeing/sensing the landscape and figuring out how to take advantage of the activity for their own gain. It is interesting to see how this will turn out. Nope. This does not accord with my understanding of current practice. 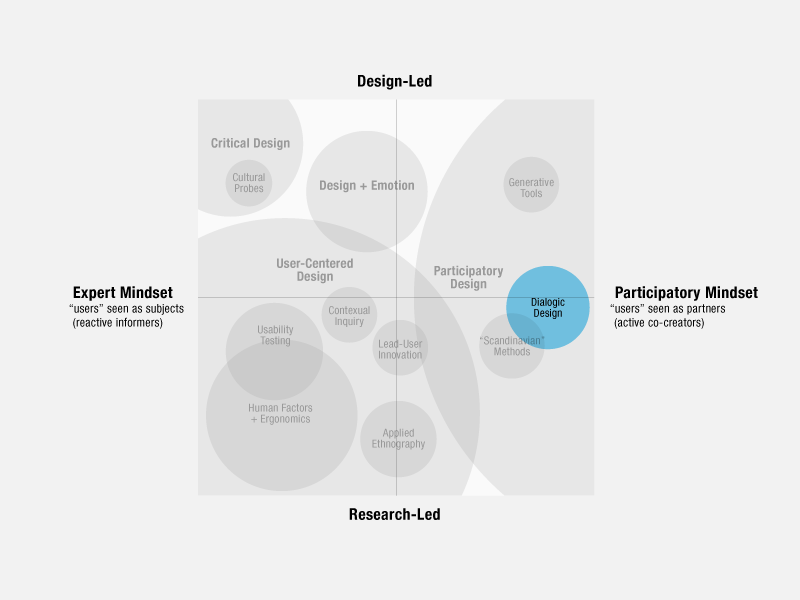 User-centred design covers both the expert-led approach and the participatory approach. I recognise the community you are talking about in the user-centred design bubble, but you have definitely picked the wrong label. I would like to complement you on the evolving map. A splendid idea and a great artefact for communicating the interrelation between the different fields. I’m currently doing an exploratory study on service design and how it overlap other areas area e.g. HCI, marketing, behavioural science or business management and how their methods influence service design. Can I possibly get your perspective on where you would place service design on the “Evolving Map of Design Practice and Design Research”? Thank you for some other informative website. The place else may I get that type of information written in such an ideal method? I’ve a undertaking that I’m simply now operating on, and I’ve been at the look out for such information. I found your blog post immensely thorough and useful . Having graduated from an MA program at Goldsmiths and worked as a designer I have put together a compendium of methods which can be found at http://www.designmethodsandprocesses.co.uk. Hopefully it will complement your rearch. It would be great to do a link exchange or if you can find some use for the methods on my site it would be great to have feedback. I think this is great work. However, just like Brian, I completely disagree with “user centered design” being conducted with an expert mindset. Quite the opposite, I would say. Generative research doesn’t have to be user participatory in my opinion. I think the term “generative research” is still finding its definition though. Great mapping. Thanks for taking the time.